Stephen Bannon, hosting Breitbart News Daily on SiriusXM Patriot at the Republican National Convention in July, is the new chief executive of Donald Trump’s presidential campaign. On Wednesday morning, as America rolled over in bed, bleary-eyed, to check its phone, it learned the news that quite a few things had gone bump in the night at Donald Trump’s campaign headquarters. Stephen Bannon, executive chairman of Breitbart News, was the campaign’s new CEO. Pollster Kellyanne Conway was now Trump’s campaign manager. Bannon’s onboarding has sucked up most of the attention. Breitbart News has been sympathetic to the Trump cause, and the idea that the campaign and the media outlet would now be inextricably linked seemed at once shocking and wholly predictable, a move of Berlusconian logic. What seems sure now is that the Trump campaign will become more Breitbart-y — invested in the conspiratorial narratives once confined to the nuttier parts of the internet — but Breitbart has been riding the Trump wave for some time. The synergistic political-media marriage that went public this week seems, if you look back at the numbers, almost destined for this meet cute. In October 2014, before “Trump for president” was a glimmer in our collective eye, Breitbart News ranked 27th in the general news category of websites, with about 8 million visitors, according to comScore data. That same month, Pew Research Center released a study on the political fragmentation of American Media, including a survey on news-consumption habits. Only 3 percent of respondents got their news from Breitbart, and 79 percent of those people had “political values that are right-of-center.” Nearly half of Breitbart readers (48 percent) called themselves “consistently conservative” (only 9 percent of respondents in the overall survey described themselves thusly and by comparison, only 19 percent of Fox News’ audience was “consistently conservative.) The site, then as now, was seen as a go-to for a vertiginously right-slanted point of view on the news of the day. On the conservative media scene, Breitbart plays the ne’er-do-well renegade role, while outlets like RedState have served as the vehicle for movement conservatism and the National Review has remained a preferred platform for the thoughts of the establishment wing of the party. 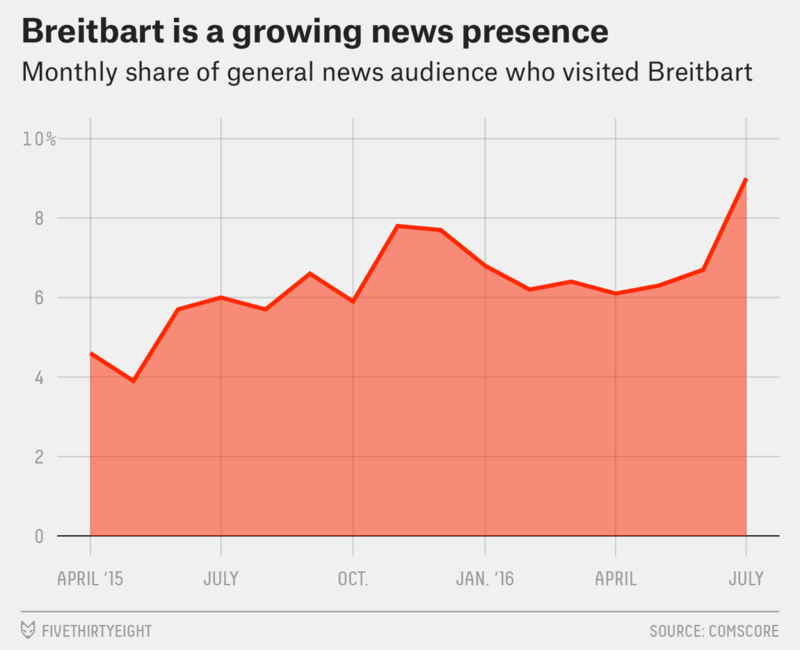 Breitbart’s traffic numbers hummed along for much of the next few months, with its share of the general news market audience — visitors to sites such as CNN and Fox News — remaining anywhere from 3.5 percent to 4.6 percent. (This doesn’t mean those Breitbart visitors only visited Breitbart.) But then in June of 2015, the same month Trump announced that he would run for president, the site saw an uptick — it was read by 5.7 percent of the general news audience and went on to take a full 6 percent in July. By November it was at 7.8 percent. Last month, Breitbart traffic was at 9 percent of the market, with 18 millions visitors. Over the past year the media outlet has been openly promoting the core issues of the Alt-Right, introducing these racist ideas to its readership — much to the delight of many in the white nationalist world who could never dream of reaching such a vast number of people. The tenor change of Breitbart did not go unnoticed or protested from within conservative circles. “Breitbart News is no longer a journalistic enterprise,” national security correspondent for the site, Jordan Schachtel, said in a statement in March announcing his resignation. Instead, Schachtel described Breitbart as “something resembling an unaffiliated media Super PAC for the Trump campaign.” Along with a number of other staffers, Schachtel’s departure came in protest of Breitbart’s perceived lack of support for one of its reporters, Michelle Fields, who was manhandled by then-Trump campaign manager Corey Lewandowski at a Trump event. Stories about Clinton suffering from “post-concussion syndrome, which can severely impact her cognitive abilities” could be found on Breitbart as far back as January of this year.